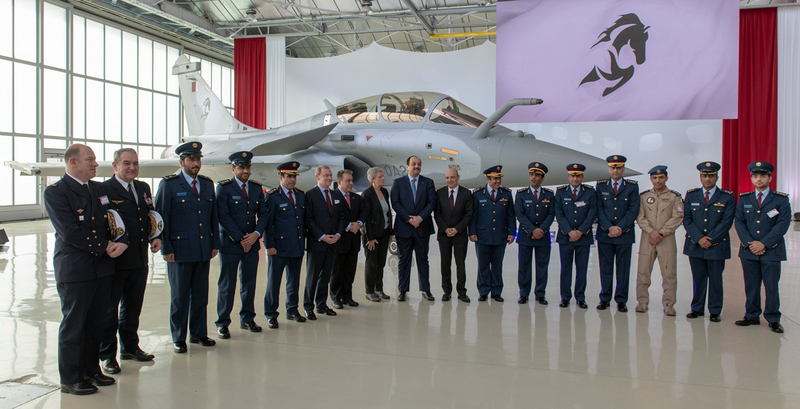 The first Dassault Rafale for Qatar was ceremonially handed over at Dassault’s Merignac facility on Feb. 6, 2019. The ceremony was attended by a host of VIPs, including Qatar’s Deputy Prime Minister and Minister of State for Defence Affairs, HE Dr Khalid bin Mohamed al-Attiyah, Qatar's Ambassador to France, Sheikh Ali bin Jassim al-Thani, Staff Major General (Pilot) Mubarak bin Mohamed Al Khayareen, Commander of the Qatar Amiri Air Force, and Staff Brigadier General (Engineer Air) Mohamed Mubarak al-Shahwani, as well as Geneviève Darrieussecq, Secretary of State to the French Minister of the Armed Forces, and Dassault Aviation chairman and CEO, Eric Trappier. During the ceremony, the new Qatari Rafale squadron was named "Al Adyiyat" after a Surah in the Koran, and a new squadron badge (a stylised Arab stallion’s head) was unveiled on the Rafale’s tailfin. During their visit, the Qatari Deputy PM and Amiri Air Force commander flew on board an Armée de l’Air Airbus A330 MRTT to watch Qatari Rafale pilots practicing air-to-air refueling. Qatar signed a €6.3 billion agreement for the purchase of 24 Rafales (six of them two-seat trainers) in May 2015. A dozen more aircraft were added to the order in December 2017. Qatar’s Rafales differ in detail from those delivered to France and Egypt, and integration of the Lockheed Martin Sniper targeting pod and Elbit Systems TARGO-II helmet-mounted target designation system required extensive testing. The first Rafale DQ for Qatar, a two-seater, made its first flight on June 28, 2016, while the single-seat Rafale EQ flew for the first time on March 27, 2017. The aircraft are being supplied with MBDA MICA IR, MICA EM, and Meteor air-to-air missiles and with MBDA SCALP-EG cruise missiles and a range of air-to-ground weapons, including laser- and GPS-guided Safran AASM (Armement Air-Sol Modulaire) Hammer missiles. Qatari personnel will be trained at Base Aérienne 118 Mont-de-Marsan in southwestern France, Rochefort, and the Joint Intelligence Training Institute in Strasbourg. Escadron de Chasse 04.030 was established at Mont-de-Marsan as the Qatar Rafale Squadron on Oct. 1, 2017. The Amir of Qatar, Sheikh Tamim bin Hamad al Thani, visited the Qatari Rafale Squadron at Mont-de-Marsan on July 6, 2018, accompanied by French defense minister Florence Parly. Under the SOUTEX program the Armee de l’Air is training 250 personnel who will man the first Qatari Rafale squadron. This unit will initially be commanded by a French officer until later this year when command will be transferred to a Qatari officer before the unit transfers to Qatar in the summer of 2020.